More than 400 State Farm employees in the company’s hub locations of Dallas, Phoenix and Atlanta will build alongside four families in need of affordable housing. The employee volunteers will contribute to the revitalization of a historic neighborhood and help complete a Habitat town home community. 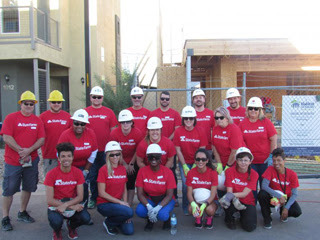 State Farm employees in Phoenix kick off celebrating the company’s 10-year anniversary of partnering with Habitat for Humanity. During the month of October, employees will volunteer in Phoenix, Dallas and Atlanta. State Farm has been a supporter of Habitat for Humanity International’s youth initiatives since 2007. The company’s commitment has helped to mobilize more than 650,000 young volunteers to build homes and advocate for affordable housing. Driven by the vision that everyone needs a decent place to live, Habitat for Humanity began in 1976 as a grassroots effort on a community farm in southern Georgia. The Christian housing organization has since grown to become a leading global nonprofit working in more than 1,300 communities throughout the U.S. and in more than 70 countries. Families and individuals in need of a hand up partner with Habitat for Humanity to build or improve a place they can call home. Habitat homeowners help build their own homes alongside volunteers and pay an affordable mortgage. Through financial support, volunteering or adding a voice to support affordable housing, everyone can help families achieve the strength, stability and self-reliance they need to build better lives for themselves. Through shelter, we empower. To learn more, visit habitat.org. To learn more, visit habitat.org. For more information about our local affiliate Verde Valley Habitat for Humanity visit www.vvhabitat.org. Or call (928) 649-6788.